As our closest relative species in the animal kingdom, monkey designs have deep connections to mankind. 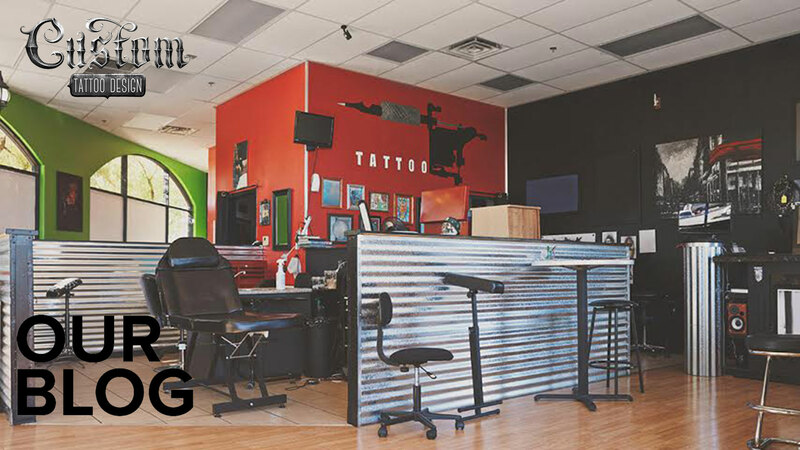 They are powerful religious symbols, and today they’ve become popular tattoo designs. 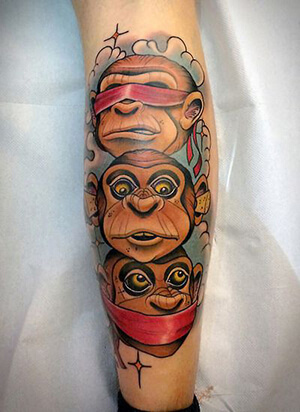 Below, we’ve assembled a monkey tattoo dictionary, spelling out the meaning behind each one of these tattoo designs. Read on, and learn all about this monkey business! 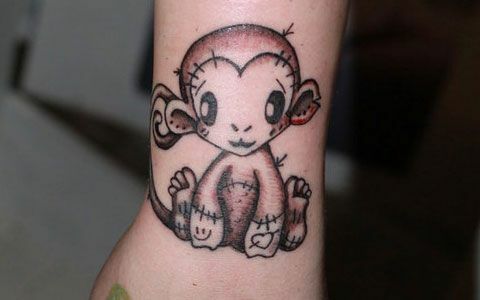 Baby Monkey: a symbol of innocence and youth, the baby monkey tattoo design is a sweet commemoration of childhood and freedom. 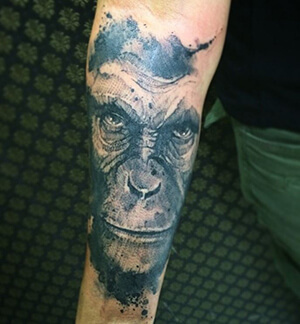 Chimpanzee: as our closest relative in the animal kingdom, chimpanzee tattoo designs represent humanity’s intimate connection to them. 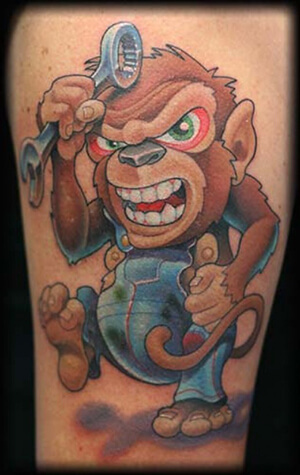 Grease Monkey: known for their tendency to disassemble and reassemble objects, the grease monkey represents a curious, inquisitive nature. Hear, See, Speak No Evil Monkeys: based on an 8th century Tendai-Buddhist phrase, ‘mizaru, kikazaru, iwazaru,’ which meant ‘don’t hear, don’t see, don’t speak,’ the ‘Hear, See, Speak’ monkeys came about haphazardly. Since the term ‘zaru’ sounds like ‘saru,’ which means ‘monkey,’ monkeys were used to symbolize the saying. This tattoo design shows an appreciation for Confucius’ Code of Conduct and Morals. 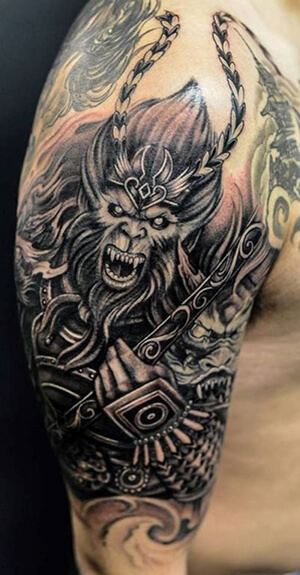 Monkey King: a significant character in Chinese mythology, the monkey king was known to have built superpowers through dedicated studying of Taoist principles. His principle powers are strength and speed, and he is known to resemble the Hindu Hanuman. 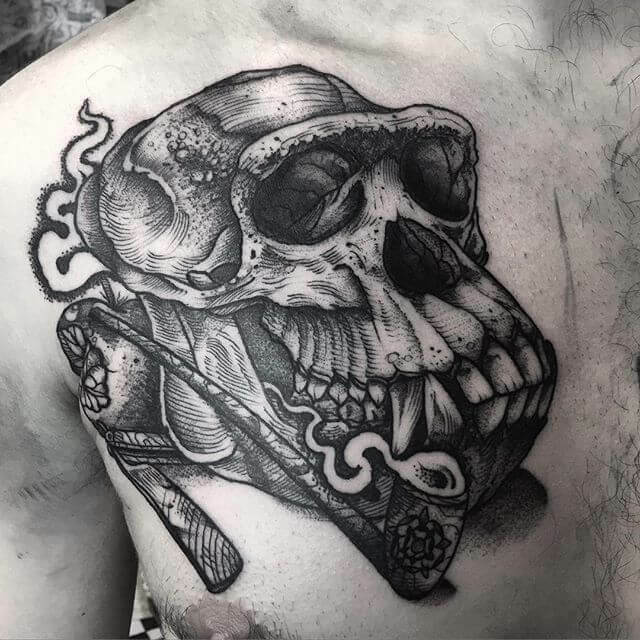 Monkey Skull: typically representing mortality and destruction, the monkey skull tattoo design serves as a reminder of man’s mortality, helping people to adjust to major change in their lives. 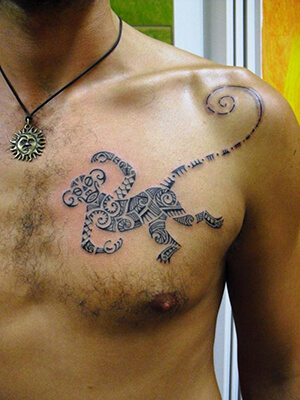 Tribal Monkey: underlining the connection between monkeys and religious symbols, the tribal monkey has ties with Polynesian, Native American, and Haida influences. The monkey’s playful nature represents religious joy and innocence. Monkeys reflect some of our most cherished human aspects, like playfulness and joy. Since Ancient times, the monkey has been held in high esteem, standing in as various religious and mythological symbols. 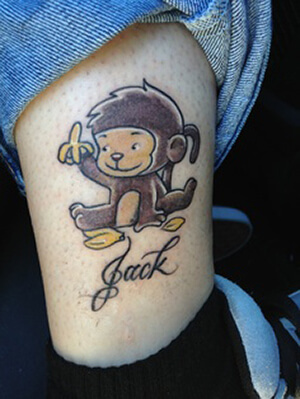 If you know of any other monkey tattoo designs, let us know about them in the comment section below!